This moment, one of our first sights of Anna Schmidt, shows her dolled up in a bizarre German comedy. 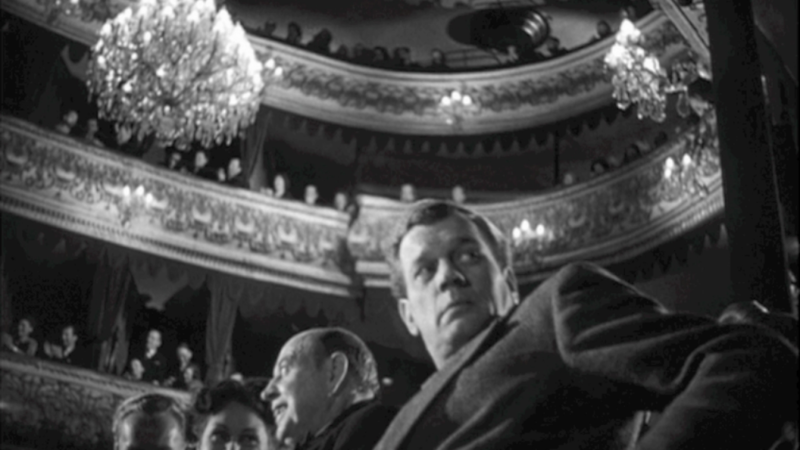 The camera swings left following the frenzied German dialogue which has the audience (except for Holly) in stitches. Holly still feels a stranger in a strange land, looking around uncomfortably at the cackling audience. Like a non-German movie theater audience, Holly can see little of the humor in this play and is forced to observe only those more universal languages: staging, costume, set design. Holly sees essentially what we can see through this still, a frozen lifeless version of what might be going on in front of him. The wit built into the comedy is erased, but what remains is the reality of the image. Holly can see only what we can see, and whatever it provokes in him, be it horror, unease or just boredom, it is enough to make him leave before the end of the performance and wait backstage until he can meet Anna. What in this comedic performance could provoke any kind of uncomfortable emotional response? In this frame alone we are presented with an unsettling image. Anna Schmidt has been the object of Holly’s (and the camera’s) gaze, but hiding in plain sight is a doppelganger. Behind Anna we see this second blonde bombshell, dressed in similar attire, her features blurred into an unrecognizable smile by the swinging camera. Forty years later, in David Lynch’s Wild at Heart, Isabella Rosellini and Grace Zabriskie would don similar wigs to play the terrifying Durango sisters. Isabella Rosellini and Grace Zabriskie as the blonde-wigged Durango sisters in David Lynch's "Wild at Heart." Image © MGM. Whatever the reason, Holly is clearly put ill at ease by the performance and, after taking one last look at the German man laughing next to him, he leaves his seat, preferring to greet Anna in the wings, and wait out the rest of the performance outside of her dressing room. Throughout this film we the English- language viewers are thrust into non-subtitled experiences just as Holly is, and his encounters will lead him to confusion, alienation, a feeling of uncanniness, and eventually fear for his life. But that is where the mastery of this film is most evident. Although we truly hold all the cards more than Holly does, seeing some conversations and events outside of his grasp, we still follow him so closely that we feel empathy with his lonely sentiment. When Holly doesn’t laugh neither can we, occupying the position of alien in this multi-cultural world of Vienna. As we watch this performance, immune to the German and the humor, we (and Holly) are like the Man from Mars in Robert Heinlein’s Stranger in a Strange Land. “‘Man is the animal who laughs,’ Jubal answered. ‘I do not laugh. I have heard laughing and it frightened me. Then I grokked that it did not hurt. I have tried to learn—’ Mike threw his head back and gave a raucous cackle. ‘You heard,’ Mike agreed sadly. ‘I cannot rightly do it. So I am not a man’ (G.P. Putnam and Sons’, 1961, pg. 143). This moment in the film reminds me of one more moment that I can’t help but bring up. To understand it, we must fudge the rules a little and look at a frame outside of our 62-second grid. Here we see the uneasy Holly Martins leaving the theater mid-performance. Holly leaves his seat, uneasily watching the German comedy performance. Image © Studio Canal. Holly has all this time been imagining himself to be a hero which we have thus far taken to mean (due partially to his own admission through dialogue) that he is identifying with a cowboy from one of his own pulpy novels. However this moment of unease might lead us to presume he is identifying with another American hero. In November of 1939 (in issue #33) it was revealed that the new masked vigilante bursting on the scene came from a similar point of origin. Leaving the theater, a young Bruce Wayne saw his parents murdered and out of that anguish grew the personality that would become Batman. Could it be that Holly, miming the same departure toward an abandoned street, sees himself not as a cowboy at all, but as a masked urban avenger? 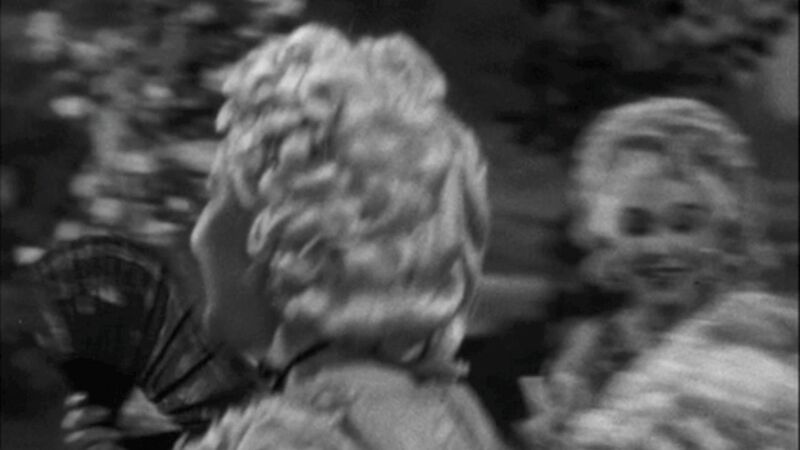 In scenes to come, it would be easy to imagine a dark shape swinging through the shadows of Vienna’s dark streets. Look at the similarity as Bruce Wayne leaves the theater in Christopher Nolan’s Batman Begins.